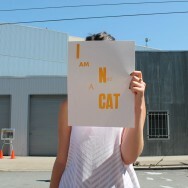 I AM NOT A CAT is a campaign to end street harassment in the Bay Area and elsewhere. During the San Francisco Center for the Book’s Roadworks Printing Festival, I invited members of the public to share their experiences with street harassment and to issue a response. I met women as young as 11 and as old as 60 who had received unprompted street harassment. I met men who had been verbally harassed by women as well as by other men. I met men and women of color and queer folk who had suffered hate speech on a daily basis. 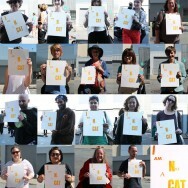 Participants were asked to hold the poster while being photographed and give an account of their names, occupations, and a record of the catcalls they’d received (Listen to the Audio Here: I Am Not A Cat). Their responses ranged from seeming compliments to outright physical assault. Participants were also given the chance to respond on tape. 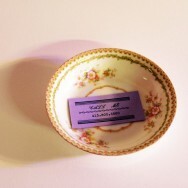 These recordings were then turned into a voicemail message, and the corresponding number letterpress printed onto a stack of “anti-catcalling cards.” These cards could then be given to persistent catcallers who, upon dialing the number, would (instead of hearing the object of their objectification cooing into the receiver) hear the responses of dozens of people outwardly and directly disapproving of their behavior. 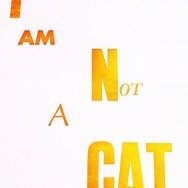 Apply for your anti-catcalling cards here. ?